One of Fluke Calibration's best-selling products is the Tweener thermometer, and there’s a reason. No other company, not one, has a reference thermometer that comes close to the performance and features of the Tweener for anywhere near its price. 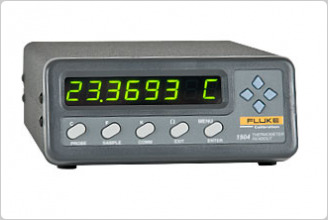 The Fluke 1502A Tweener (formerly Hart Scientific) features accuracy up to ±0.006 °C (the 1504 is even more accurate, up to ±0.002 °C). In addition, it reads 100-ohm, 25-ohm, and 10-ohm probes, has a resolution of 0.001 °C across its entire range, and is the smallest unit in its class. It also has an optional battery pack for completely portable operation. Each Tweener is programmable to match a probe’s constants for maximum linearity and accuracy. All probe constants and coefficients are programmed through simple, front-panel keystrokes. Temperature is displayed in °C, °F, K, or resistance in ohms. For convenience, the 1502A reads the common industrial grade IEC-751 or “385 ALPHA RTD without any programming. Enter the actual R0 and ALPHA of the individual probe for increased accuracy. For maximum accuracy, use the ITS-90 formulas. The Tweener accepts the subranges 4 and 6 through 11. ITS-90 formulas reside in the Tweener’s firmware. If your probe has been calibrated for any of the above subranges of the ITS-90, you simply enter the coefficients directly into your Tweener.